We've begun accepting applications for our next cohort, scheduled for fall 2015. Over the next few weeks, we're hosting a series of webinars for those interested in learning more about the Junto program, what types of companies are the best fit, and the expected outcomes from participating. Register for a webinar today and please share with friends. We’re four months into the current cohort, JuntoIII, and it’s been an exciting time for many of the JuntoApprentice companies. The same goes for a number of the Alumni companies, several of which are seeing rapid growth in the first half of 2015. 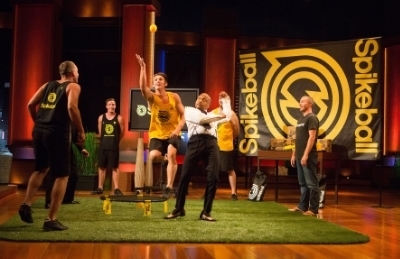 Daymond John plays a quick game on Spikeball during the Shark Tank episode. Tiesta Tea's bulk tea display in Safeway stores. Earlybird (JuntoIII), a technology development firm, continues to grow its partnership with University of Chicago Medicine, which engaged Earlybird to build a management platform for the hospital's many clinical trials. GetMaineLobster.com (JuntoII), an online purveyor of fine seafood and lobster from the state of Maine, has experienced steady 25% quarterly growth over the past three quarters. KnowledgeHound (JuntoIII), the Google of market research for big brands, recently closed its $1.2 million seed round to expand its team, raising all funds from Chicago-area angels. Solid (JuntoII), a full-service software development firm, has achieved monthly sales growth of 300% since the start of 2015 and has added three new people to its team. They also adopted the Open Book Management methodology and implemented the Great Game of Business, seeing the highest employee engagement and positive results since founding the company. Spikeball (JuntoII), the manufacturer and marketer of its eponymous outdoor game, appeared on the season finale of Shark Tank, which not only led to a healthy “spike” in sales but also follow-on press in Crain’s, on Windy City Live, and NBC’s Today show. ThreadMeUp (JuntoII), a platform to design and sell custom merchandise, achieved its highest sales month ever in May, and is in process of closing its first round of funding. The company hired a new full-time web designer and is expanding their tech, sales and marketing teams. Tiesta Tea (JuntoI), a distributor and marketer of loose leaf teas, introduced a new “store within a store” merchandising display, in partnership with the Safeway and Albertsons grocery chains. TopstepTrader (JuntoIII), a platform for aspiring traders to become funded traders, is experiencing strong revenue growth and continues to focus on building a great support experience for their users. We didn't reach the right market. JuntoGlobal was positioned for companies that want to enter or expand in the U.S. market and have 5-50 employees. Far too many of the applicants we received were smaller and earlier stage, often not having the ability to afford the tuition or expecting an accelerator program. We need more time to give applicants more time. Much of our timetable was modeled after that of other startup accelerators and "study abroad" programs but in retrospect, we learned that more time is necessary for both sides. When attracting interested companies from different parts of the world, we must allow for adequate time for visa applications, requests for sponsorship funds, and consideration of living arrangements. And because they need more time to do these things, we need to allocate more time to our internal application and evaluation process. There is indeed demand. An outcome of the dozens of exploratory discussions and applicant interviews was clarity that there is demand overseas to learn management and leadership from American entrepreneurs. Most people openly validated the purpose of JuntoGlobal and the curriculum, at times asking if there was a way to bring the program to their own home country.